I’m looking for a 1992 Tyco 10 inch long tan Kitty Kitty Kitten that ”purred” when the head was tilted or the body was rocked. She had a purple with silver dots ribbon around her neck. 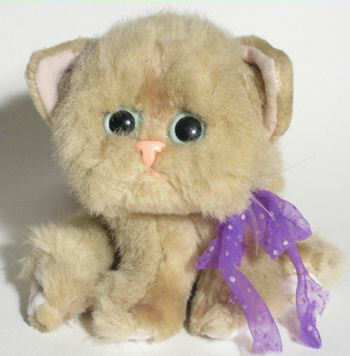 I’m 24 (NOW)… When I was 5 I got this kitty in my Easter basket. She became my best friend. My dad has a problem throwing all my stuff away, and over the years he threw her away. She was my most prized friend, and I have been on a hunt for a replacement for years and years with no luck. I just so happened to stumble across this site today. I have a 2 year old daughter and would love to be able to find my old best friend and have it become her new one! If anyone knows where I can find this lost friend, please let me know! I’m praying for luck! DSI Industries also made a version of these kittens in 2001. Hope that helps your search. My name is Darian. I’m 18, and i’ve had that exact kitten since the day I was born. My kitten lost her purple silver dotten ribbon. Just thought i would share this with you. I’ve never met anyone else who had the same kitten as me.